My wife and I went to see the Movie Lincoln yesterday. After all, it would be a shame to have the Academy Awards come and go and not see any of the nominated movies prior to the Oscars being handed out. We thoroughly enjoyed the experience. The time passed much quicker than the 2.5 hour movie length would suggest. As we sat at a restaurant immediately following the movie, I commented that I have no idea how much of what I just saw was actually true. Of course, I know the history book big-picture facts of the Civil War and Lincoln’s presidency and his death. Unlike some of the Los Angeles Lakers who watched the movie together, I was not surprised when Lincoln died at the end. But how much of what was before my eyes in that theater really happened as portrayed? I don’t know. Most of the exact dialogue had to be conjured up to fill in the blanks that still exist to this day. The movie credited one particular book at the end as what the movie was in part based on, but other sources and surely much creative license were employed to supply the details. There is no other option given the historical time frame in question and lack of detailed recording that is commonplace today. Reflecting on the movie, then, I am challenged by the fact that I cannot take many particulars for granted as historical truth. I know, however, that there will be untold millions who watch the movie and who then have that picture and that dialogue in mind as historical fact. They may never read any book on the events or the time period. They aren’t even likely to read the book that the movie was based on to see how closely it followed what was written there, much less what is written elsewhere. That means that if I really want to be able to separate fact from fiction, it is up to me to do more research. It is my responsibility to learn what historical documents exist and what they tell us, and then to be able to know what is fact and what is surmised and what is merely good cinema. This is true not only for a movie about some past historical figure, but also for documentaries that may very well be created with a philosophical or political slant intent on leading the viewer to a certain point of view. In the end, the content of what I watch – even a movie like Lincoln – may be created in a way to lead me to certain conclusions. Still, it is my duty to pursue truth diligently so that I come to my own best conclusions of what is factual. With that in mind, let’s shift the discussion to something that is far more controversial, but, I believe, closely related to the above. In the wake of mass shootings such as the tragedy in Newtown, Connecticut recently, the topic resurfaces about whether and how violence in media such as video games, movies, television and music plays a part in the eventual actions of those who carry out such atrocities. Debates rage on with people firmly entrenched on both sides. Studies are occasionally done that yield results (most likely inconclusive) eagerly latched onto by one side or the other. Be careful, of course, about such studies; always check who paid for them in order to sniff out potential bias. I am not an expert in the subject of the impact of media and game violence on personal behavior. I do know, however, that companies spending untold billions of dollars annually on media advertising sure do assume that media have an influence on behavior. If not, then every marketing campaign from every company that ever claimed a positive return on investment is fictional, and we know that’s not the case. Advertising works because it creates a desire or fulfills some perceived need. How can this impact not also be true when a violent action or way of life glamorized in some medium – movie, TV, game, music or otherwise – nurtures in someone a desire to live out that fantasy? What if that media experience contributes to one’s perception that a personal need will be met by acting out that behavior? Is that any different than the desired goal of corporate advertising, to influence behavior? I will only believe such violent media have no influence on behavior when all advertisers unanimously and adamantly agree that all of their media advertising yields no results. But that isn’t where the analysis ends for me. I don’t blame the Newtown shootings on video games or any media. The above comments only address the media influence part of this post’s title. 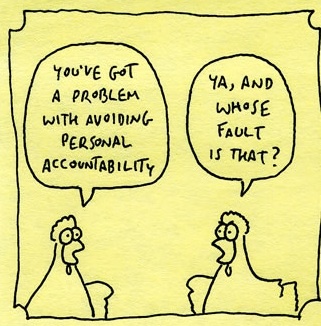 The other part is about personal responsibility. Coming back to the movie Lincoln, I can walk away from it believing and claiming that those exact words were exchanged between key characters. I can believe that Lincoln and others looked exactly like they did on the big screen. I can believe that household furnishings, battle scenes and street scenes were exactly as shown in the movie. I would be ignorant to believe any of these, but it is still my option to absolve myself of any personal responsibility for separating fact from fiction, and to take the easy route by assuming the movie is entirely factual. The killer’s mother should not have had those weapons and trained her son in how to use them. The killer was mentally ill and never received the help that he needed. The school should have had better security. The laws should have been more stringent. School personnel should have been armed so they could stop him. He was obsessed with playing video games. You may have seen fingers of blame pointing at additional people or circumstances. What all of the above bullet points ignore, though, is that the killer chose to do what he did. His mother did not make him murder 27 people (including her) and then commit suicide. He chose to do that. Different laws in place would not have stopped him; he chose to break numerous laws that day – stealing, carrying a weapon into a gun-free zone, breaking and entering, murder, and suicide. People intent on breaking laws don’t give a damn about any laws intended to stop them from doing what they are determined to do. Different security in place in the school would not have stopped him from attempting his chosen path; the school was exemplary in its security and preparedness within the confines of the law. No video game he ever played made him pull the triggers that day; he did it of his own free will. The gun manufacturer met a legal consumer need as perceived by the killer’s mother who legally purchased the guns, and neither the gun manufacturer nor the NRA pulled those triggers; the killer alone did that by choice. He is personally responsible for his actions, even if other factors may have influenced his life to some degree in harmful ways. Why are we as a society so eager to absolve ourselves and others of personal responsibility? Why do we think that the chosen actions of others are preventable by additional actions on our part or by the government? We see it in the nanny state where many think it is the responsibility of the government to take care of them more than it is their own responsibility to do so. We see it in the irresponsible, live-for-the-moment lifestyles of those who fail to plan, fail to save for a rainy day, fail to work hard, fail to take out insurance and then expect the government (which means those of us who work and pay taxes) to swoop in and bail them out whenever things get tough. For the record, folks, it’s nobody’s job to take care of me except me, myself, when it comes to having food, clothing, shelter and basic security. If I hit a rough patch, it’s up to me to do something about it. If a tornado takes my house, that’s why I have insurance. My taxes help pay for basic public services and protections shared by all, not as a piggy bank to open if I think I need it during hard times. “Out of the abundance of the heart the mouth speaks” – Matthew 12:34. Actions have consequences. Environments have influence. Ultimately, though, we and we alone are responsible for our actions. The sooner individuals, society at large and our government realize this, the better off we will be.